On the surface, Saimone seems like an ordinary guy. 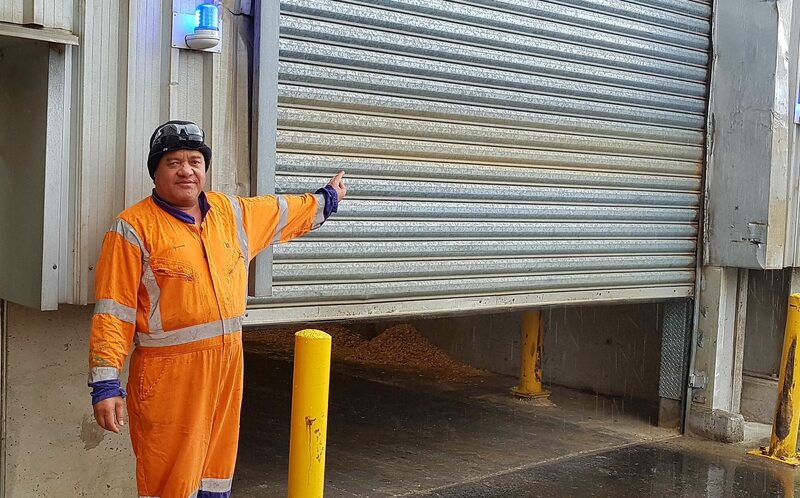 He’s an Operator at Waste Management Technical Services, and has been working there ever since he arrived in New Zealand. Married with kids, his main focus is to work hard, earn money, and provide for his family. He’s just celebrated his 20th anniversary with Waste Management, and plans to be there until retirement. But dig a little deeper, and you’ll find that Saimone is an inspiration to his organisation and his colleagues. Saimone is proof that it’s never too late to start learning. A few years ago, Saimone decided that he wasn’t happy with the level of his English. Although he’d been in New Zealand for coming up 20 years at that point, in his own words, “I’d just been hanging out with other Tongans, speaking Tongan and never English!” His ability to comprehend and express himself at a high level in the workplace was limited, and had felt ready for more opportunities. To change this, Saimone accepted Waste Management’s offer to put him through an Upskills course, designed to increase literacy, numeracy, and all-round workplace training. As a part of every Upskills workplace training course, students are required to carry out a project in their current workplace, as a means of putting their newfound skills into action immediately. In Saimone’s case, he identified an issue that had been costing Waste Management thousands of dollars every year. The entrance to one of Waste Management’s warehouses was controlled by an automatic roller door. This door would open for truck drivers to come through, stay up for two minutes, then automatically close again. Trouble is, inevitably, it would close at the wrong time, and damage trucks—drivers weren’t noticing that the door was closing, or would think they had enough time to ‘race the door closed’. Every six months or so, a truck would collide with the roller door, and both would have to be repaired. Saimone’s project involved installing warning lights on the roller doors, which would automatically begin flashing when the door was starting to close. Drivers were informed that once the lights were flashing, they were no longer able to make it under the door. Saimone was involved from start to finish, proposing the idea to management, and seeing it right through to implementation. Ultimately, over the last two years, Saimone’s project has saved Waste Management tens of thousands of dollars in damages, not to mention all the avoided hassle. When asked what inspired his creative cost-saving project, Saimone points towards the increased confidence gained through Upskills workplace training. “I feel like I have a new lease on life—I can now express my ideas and actually communicate them to management. Management are really happy with me here.” Having the ability to contribute more in his role is a big change for Saimone—and having management happy with him is a nice added bonus! To implement the kind of training that has made Saimone so confident and effective, contact us today.